Discussion in 'Photographers Phorum' started by Teegate, Jun 8, 2014. Wow! Thats a nice stone! I have one down here very similar in DixWMA.have no info on my stone at all.Not on a corner that I know of,just wandered into it with a friend hunting mushrooms. Was out in Lebanon yesterday driving in the woods and saw something on the side of the road. I got out to investigate and it was just a dead dear that a hunter had left. As I was walking back to my car I heard a woman's voice calling to me. Turns out it was an older woman out for a walk and after talking a while she gave me a tip on where to find some ruins of what might be an old deer club. After arriving home I checked HistoricAerials and it looks like it first shows up in 1963. Jessica and I will check it out next weekend and post. We were out looking for stones and found quite a few. Here are two of them. Looks like two of them together. Lots of Chestnut Oak in that area. It is a really nice area to explore. Turns out it was an older woman out for a walk and after talking a while she gave me a tip on where to find some ruins of what might be an old deer club. After arriving home I checked HistoricAerials and it looks like it first shows up in 1963. We traveled to the area that the woman mentioned and found the ruins she was telling us about. As I mentioned they showed up for the first time in 1963 but may have been there as early as 1957. They do not show up in 1956. It was a long thin building with a concrete foundation with what appears to be varying depths to it. 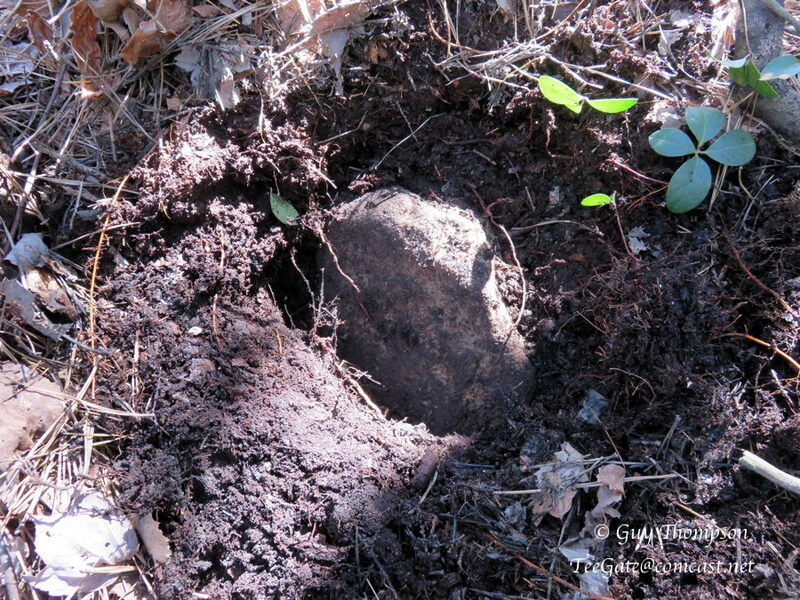 It has a large pipe inside it sticking out of the ground so I would have to assume it was a home or a gun club. Nearby there is a tire dump with a large cellar hole. There is a small trash dump nearby also. At first glance I was a little concerned. Then we found this old property stone in Upper Mill. And this stone and state monument off of 4 Mile Road. Guy, what is that belt-like object in the last photo to the right of the stones. PS: I'm going to show my 5-year old grandson Aydan that photo of the costumed skull. I'm going to tell him we have no idea who put it there, or what it means. What do you think his reaction will be? Not sure Bob. You can tell I only have one thing on my mind when there. It may have been a serpentine belt. We were only 200 feet from a road. Most likely the same as mine for the first second I saw it. It was a cold one this morning but we still headed out to look for a few more stones and monuments in Lebanon. 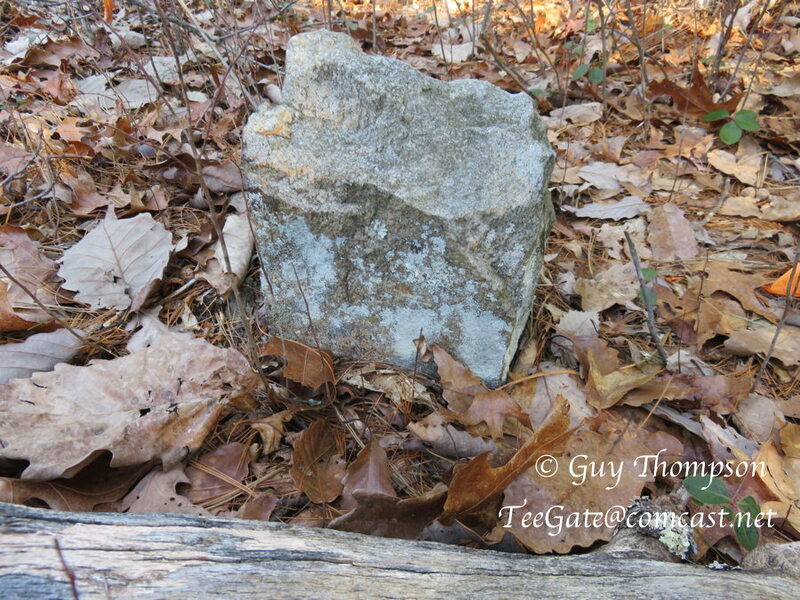 This monument is NJ9 and one of the older property monuments in that state forest. The property it represents was owned by Thomas Early and wife who sold it to the state on March 14, 1910. As far as I can tell it is the 5th oldest acquisition in Lebanon. In order as far as I can tell. If the name "Early" sounds familuar you may have noticed it on old maps of the area which showed "Early's Crossing." And not only is it on old maps it is on Google and even the Live Maps from this site. You should see it right in the center of this map. Not far away we found NJ117 and NJ4 15 feet from each other. NJ117 has the lead top which tends to disintegrate after many years. From there we traveled to the North Branch Bogs owned by the White family until the state acquired it. 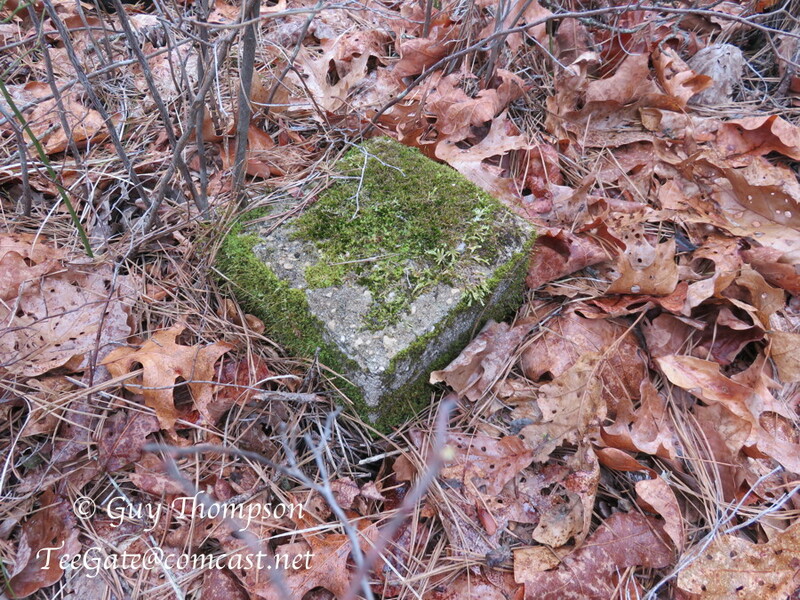 Here we found this old stone and state monument deep in the woods off of a fire break. It is sandstone so there is little chance it was incised and the ground was frozen so I did not check. And one final North Branch Bogs find ( NJ 181) that is damaged by water and ice cracking the concrete at the base. Nice to see your still finding stones up there.No maps down here and no fresh acquisitions on the deed site either.Reduced to picking corners off of tax maps and that hasn't produced much. Still working on many things. I decided this winter to spend time searching for the more elusive stones that Jessica and I have not been able to find in the past. Because of that I have not found many this winter. We are out every weekend but rarely come up with much. As soon as the weather warms slightly and if stays dry Jess and I have some really tough ones to find. I am working on a few stones tonight that are surely no longer in any records except what I have here. In the middle of state land and pretty much lost. I also am going to try and find out about a 5" x 5" granite stone that was buried 24 inches underground on 11/4/1935 with the initials of the two townships on each side of it. I think I know where it is but will have to get permission to dig if nobody knows anything about it. I am sitting here now thinking about the best way to proceed with this. Digging anything anymore can be troublesome. I have the surveyors field notes and after a year or more of looking at them I still am confused. They just do not give enough info for me to be certain. If I don't get to this in the spring I will have next winter to work on it. It will still be there. you going to use a long probe before digging? on private property i assume? Maybe on private property. It may be in a road. I am still trying to figure that out. smoke_jumper and manumuskin like this. I made one at work years ago but it it not 2 feet. I still need to narrow down the exact spot. That may take some research. What today on Google is called Lebanon State Forest Road was originally called New Glasshouse Road. On the 1940 aerials you can see the very early construction of the road where earlier 1930 aerials show it being quite remote. During the construction of said road the state had to carefully weave it between two properties owned by J.J. White. The eastern property was a little over 43 acres and on the very western corner of it along the new road was a white stone marking his property corner. 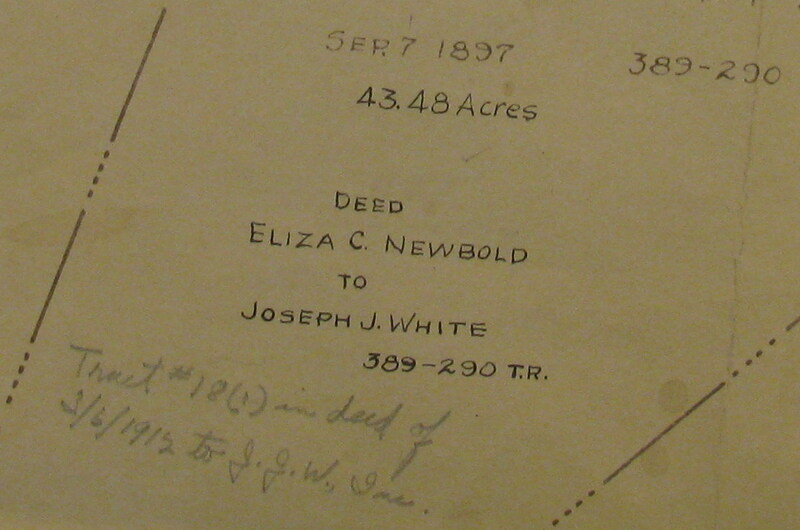 He had acquired that property on 3/6/1912 from Eliza Newbold and the property was originally surveyed on 9/7/1897. With only about 70 feet to play with the state carefully put two curves in the road at this general location to make it fit between his holdings. I have looked for this stone before with no luck but today was different. It may have last been visited in 1942. The surveyors note from 1942 discussing the road. 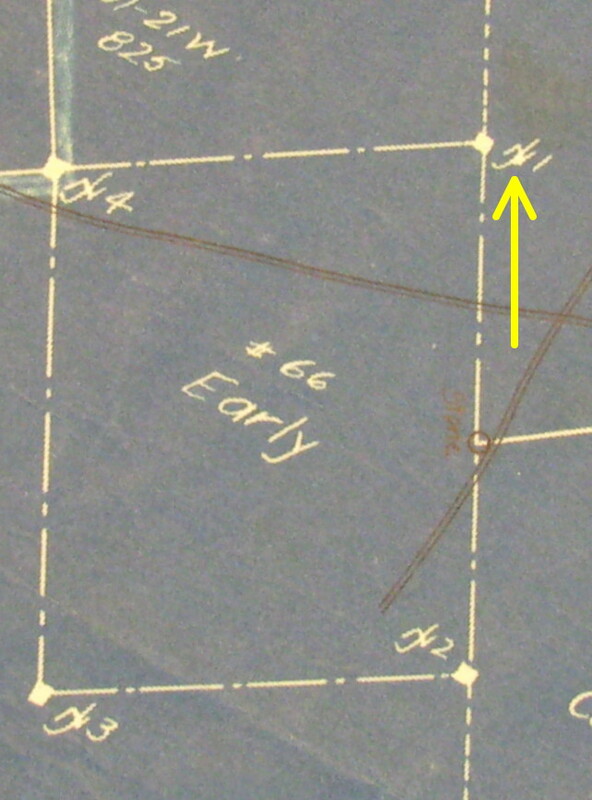 And a portion of an old survey map of the property. And it appears to me that sometime between 1940 and 1956 the property was logged and on the most recent aerial you can still see the property lines. Two more White Stones to find. I will update when I do. Menantico, manumuskin and smoke_jumper like this. 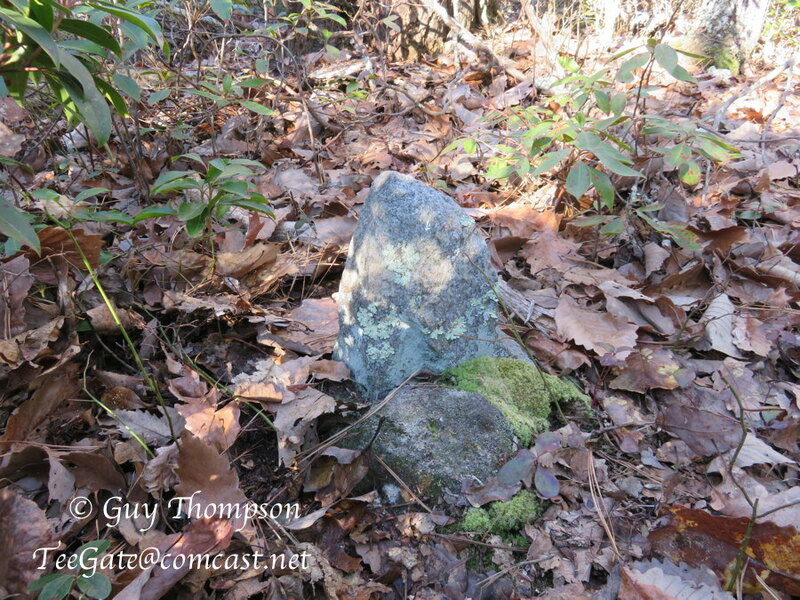 I have spent quite a bit of time trying to find the first numbered monument in Lebanon State Forest and this morning I found it. 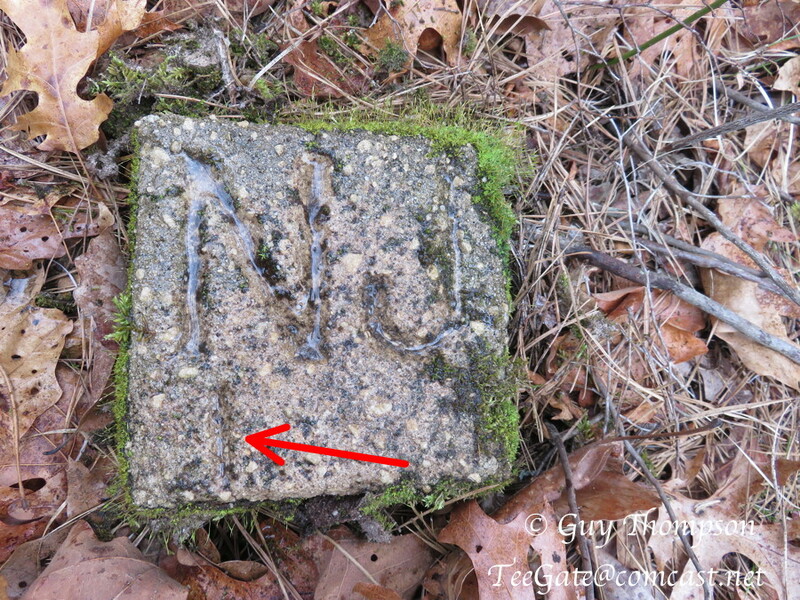 It is NJ1 but it may not have been the first monument placed in Lebanon. Then again it may have been. I just don't know. In any event, this is NJ1 and was one of the corners of the Thomas Early tract. Early map of Lebanon showing NJ1. I have found NJ2 and NJ4 but not NJ3 so far. Arrow pointing to the number 1.
bobpbx and manumuskin like this. A few facts I have come up with. 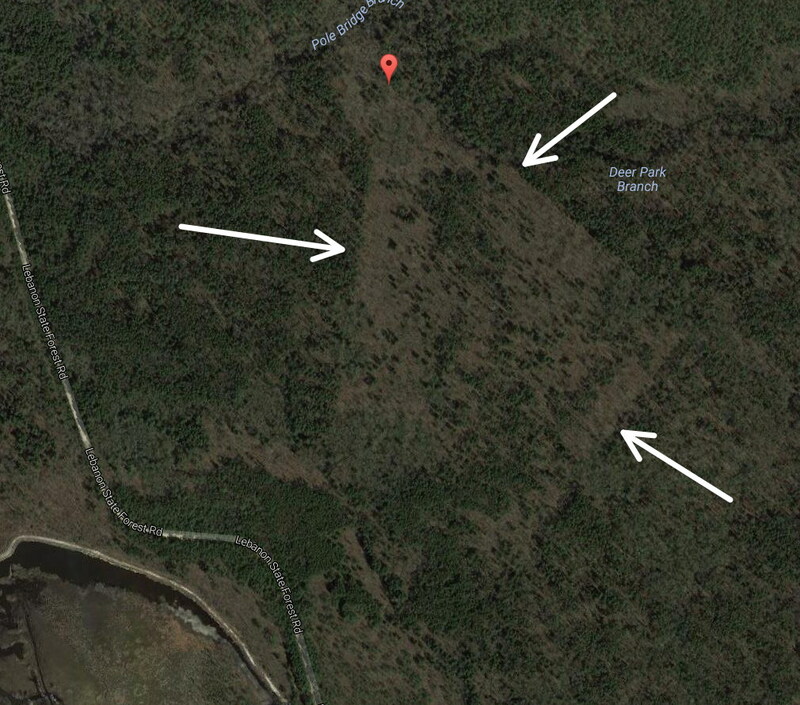 Have you driven by this clearing on Buzzard Hill Road near Pakim Pond and wondered what was there in the past? 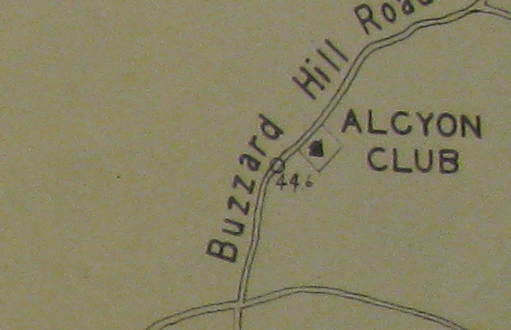 That appears to have been the Alcyon Gun Club and it was there as early as 1933. I am not sure when it ended. So we now know the Alcyon Gun Club had been there as early as 1929. December 22 - A buck with eight prongs was brought back today by Oliver Y. Jackson, of Pitman, who hunted with the Alcyon Hunting Club in the Lebanon State forest at Glasshouse near Ong's Hat. Three other members of the party also brought down bucks, They are Edwin Walters, of Pitman; Melvin Kirkbride, of Barnsboro, clerk of Mantua Township Board of Education, and William Linkuist, of Merchantville. I am pretty confident this was Oliver. Jon Holcombe and bobpbx like this.